Is Ethiopian food the best vegetarian food you’ve never had? Quite possibly! We Ottawans are a fortunate bunch. No, not because we’re the shawarma capital of North America. We’re fortunate because we have not one, not two but FOUR Ethiopian restaurants in town. And guess what? They’re all GREAT! Most large Canadian and American cities have one or two restaurants from the horn of Africa if they’re lucky. Also like many of you I usually ended up spending my hard earned Canuck bucks at one of the seemingly dozens of Lebanese Restaurants in the area. My infatuation with Ethiopian cuisine started about a year ago when I was bored with my usual rotation of restaurants and wanted to try something different. My wife Amanda and I were meeting another couple for a sit-down meal in the market area and our friends being the good sports they are agreed to try out Ethiopian food with us at the East African Restaurant on Rideau Street. The rest, as they say, is history. Ethiopians traditionally eat vegetarian more than 200 days a year which means that Ethiopian restaurants will have an abundance of vegetarian and vegan dishes. East African cuisine also caters to the palates of spicy food lovers as well as those who don’t fancy needing a fire extinguisher table side. For example mesir wat (my favourite) is a red lentil stew made up of red lentils, onion, garlic, ginger and berbere spice is a delicious and SPICY stew while kik alicha (Amanda’s favourite) is a mild yellow split pea stew with some garlic, ginger and turmeric in there. 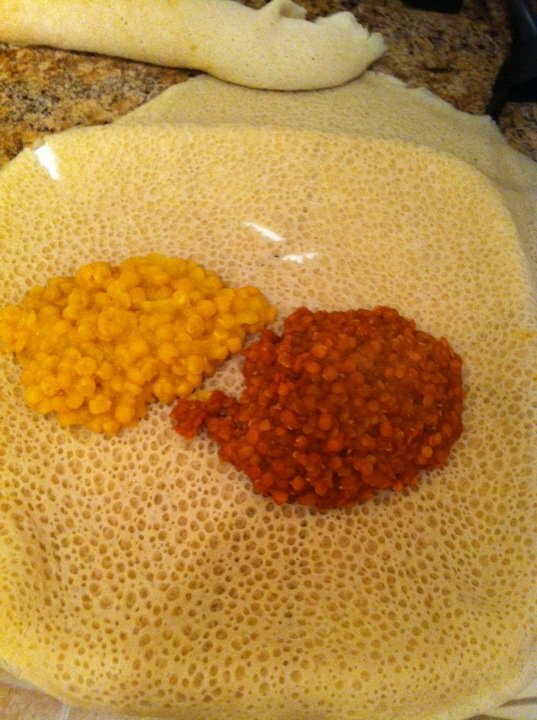 The wats are served on a large slightly sour crêpe type bread called injera which is placed in the centre of the table. Ethiopian stews or wats as they are known are generally pretty easy to make at home and are SUPER easy on the wallet to boot! I buy my injera from either East African Restaurant or Habesha as it’s quite difficult and time consuming to make at home. This is some seriously healthful food! Since these dishes are usually comprised of beans, lentils or legumes and spices you’re getting a bunch of fibre and complex carbs and that ever so important macro nutrient for vegetarians, protein. When eating Ethiopian cuisine you break off a piece of injera and “scoop” up the stews or wats as they are known. Also, everyone eats from the same dish. No utensils and one plate mean fewer dishes to clean! As for the best Ethiopian restaurant in Ottawa, there is no clear winner. Well luckily for you I’ve prepared a list with the answer to that very question! 2. Get some friends to come along with you. Remember, Ethiopian food is great for sharing! 3. Order the vegetarian combination plate (which is vegan) and enjoy! 4. Send the NCVA an email to thank us for introducing you to some of the most flavourful, healthful and just plain tasty food you’ve ever had. I’ll be posting a few of my favourite tried and tested Ethiopian recipes in the coming weeks so stay tuned! Great post Shaun! I had never tried Ethiopian food before moving to Ottawa but I was hooked as soon as I tried my first ingera! My favorite is Blue Nile followed by East African Restaurant.